The two most dynamic candidates in the 2016 presidential election, Donald Trump and Bernie Sanders, had one thing in common: they knew Main Street Americans were sick of the economy being rigged against them. But understanding how the economy was rigged was never a topic that could be fully explained in the middle of a campaign. 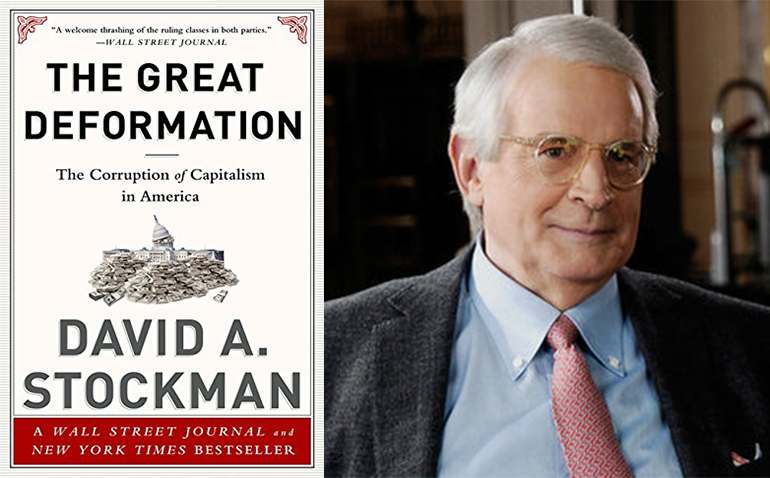 Enter David Stockman, a former Reagan advisor and the author of The Great Deformation. Stockman’s book is an opus about the mechanisms by which Washington tilted America’s economy in favor of the rich. The tilting happened when Washington decided to print excess money whenever it liked. That original sin then triggered growth among big banks at the expense of middle class jobs. The story goes something like this: more than forty years ago, the Federal Reserve decided the way to avoid future recessions was to inject more money into the economy at any sign of trouble. Their fear was that, if they didn’t fire up the printing presses, prices would drop (deflation) and the economy would tank. They also knew that Congress could not control its spending, which required the Fed to print cash to pay for Congress’s deficits. The newly printed money benefitted big banks and corporations, not working Americans. The excess money in our economy meant interest rates were nearly zero, giving bankers the incentive to make risky bets instead of investing in the slow, stable growth of employers in Middle America. Think of this as big banks being given the chance to play with house money. The casino (the Fed) provided the chips, and banks were not going to put them in a safe piggy bank. They were going to start rolling the dice. “Rolling the dice” for banks meant playing the stock market. They bet on the housing market, speculated about how fast the Fed would print money, and gave big corporations giant, unsafe loans to buy out their competitors. All these financial games pulled money out of the productive economy and put it into an endless cycle of stock trading. Trying to increase your share price became so lucrative and important that corporations bought back their own stock to bid up the stock’s price. Again, money flowed to shareholders, not workers. Even when the money did flow to typical employers, those employers had an incentive to take out loans at low interest rates (again, thanks to the Fed) to buy equipment to replace workers, not pay them. Couple all that with the fact that other countries like China manipulated their own currency to keep the value of their goods cheap, and it’s no wonder that America stopped making real goods at home and American jobs fled overseas. In short, the biggest players in finance used loose monetary policy to get rich. Financiers then used those riches to hire the best lobbyists in the world. The lobbyists led Congress to write regulations that further entrenched their power (see, for example, Dodd-Frank). And any time markets looked shaky, they convinced Washington to bail the banks out. Stockman provides exhaustive documentation for his argument, but the most persuasive evidence is the stock market itself: today the S&P 500 is twenty times more valuable than it was in 1980, while real wages have barely budged. Stockman wrote The Great Deformation in 2013, and those who read it at the time probably saw the rise of populism coming. The book isn’t without flaws. The massive tome is not accessible to beginners. Stockman isn’t writing for the layman. He’s writing to shame policymakers—those knowledgeable about monetary and fiscal policy—for what they’ve done. Stockman also understates some of the difficulties with implementing his policy recommendations. For instance, convincing risk-averse Treasury Secretaries and Fed governors to avoid bailouts and trim the money supply will be difficult. And Stockman won’t admit there must be periods, like the Great Depression, where there simply isn’t enough cash in the economy to allow for all the transactions that would normally take place. On the whole, though, Stockman’s book is important reading because it’s about crony capitalism—how Washington was captured by a small group of powerful interests. Cronyism is a pernicious force, and it’s happening at every level of government, including here in Mississippi. Just like in Washington, Mississippi lawmakers have afforded plenty of money and regulatory protections to their favorite businesses. Mississippi’s government may not have the ability to print cash, but it has bailed out businesses at consumers’ expense (see the Kemper debacle) and it certainly insulates incumbent businesses through regulations (see occupational licensing, for example). Voters finally signaled they’ve had enough of that model of government this last election cycle. Politicians in Mississippi who don’t take notice will probably pay a price.